By Gordon Frickers, measures 20 x 25 cm (8″ x 10″), oils. Some of the statements made by Chris Bodiington who’s father commanded HMS Unique when she was lost, are inaccurate in part because a mystery remains however the gist of the story here is factual. A brief history from the research of Gordon Frickers into the story of HMS Unique and the British U class submarines. HMS Unique was one of the second build group of the U-class which consisted of twelve submarines. This second group included a number of submarines that would go on to become particularly famous the foremost being HMSUpholder commanded for its entire career by Lieutenant-Commander Malcolm David Wanklyn VC, DSO & Two Bars. Contrary to some photos on the Internet, records clearly say Unique was one of 4 U class submarines (including the famous HMS Upholder) fitted with 2 external tubes in a “blister” at the bow illustrated in this painting. 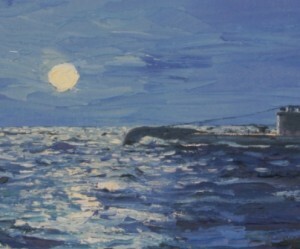 A watercolour probably made by one of her crew or an eye witness, apparently signed E. Sydney James (the signature is not fully legible), further confirms the “blister”. The ‘blister’ was not a success. It was reported to make handling the submarine under water more difficult. Armaments for British U class submarines normally consisted of four 21″ torpedo tubes with a cache of eight Whitehead torpedoes together with a three inch deck gun which could fire a 17.5 lb shell to a range of 12,000 yds. This was the third time of use for this name by the Royal Navy and first by a submarine. The name was introduced in 1804 and given to a Schooner which unfortunately was taken as a Prize by a French Privateer two years later. This U class submarine Unique was launched with this name. After trials and work-up in Great Britain Unique was deployed in the Mediterranean. She joined the famous 10th Submarine Flotilla in Malta during early 1941 and carried out patrols to intercept supply ships and escorts on passage to and from North African ports. Unique sank the 2,500 ton ship FENICIA on 10th March 1941. 1941 in June whilst in the western Mediterranean Unique sank another supply ship. During patrols off Tunisia Unique carried out a joint operation with the submarines P32 and P33 to intercept a convoy of four troopships known to be on passage to North Africa. August and sank the liner ESPERIA eleven miles off the coast. HMS Unique returned to Great Britain for a refit in September 1941 and on completion was deployed in Home waters including on patrol in the Arctic in defence of Russian convoys against German surface ships and U-Boat attacks and for Atlantic convoys. She took passage to the Med to resume Flotilla duties on 7th October 1942 and was diverted, ordered to carry out a patrol off the Spanish coast. HMS Unique is believed to have been sunk without survivors on 10th October 1942 following explosions heard in the area. However no claim was made by German sources for any sinking. According to Christopher Boddington, there was a report of a Coastal Command aircraft, he specifically mentioned a Wellington, sinking a U boat in that area at that time however the Germans did not report a loss and the range would have been rather long for a Wellington. “According to Christopher Boddington, son of the last captain of Unique, Service colleagues told the family at the time that there was a report of a Coastal Command aircraft sinking a U-boat in that area on those dates, but that the Germans did not report any loss, or indeed claim any British submarine. Certainly the British Ministry of Defence would not have admitted an accident like that during war time. That said the most likely cause of the loss of HMS Unique with all hands remains an accident onboard or striking a mine. The Commanding Officer on build was Lieutenant A.D. Collett RN, who was relieved by Lieutenant A. Hezlet RN (Later Vice Admiral Sir Arthur Hezlet KBE, CBE, DSO, DSC) who commanded during the patrol when ESPERIA was sunk, and at the time of loss Lieutenant R. E. Boddington RN. The class is sometimes known as the Undine class, after the first named submarine built. As the World War 2 loomed, twelve new U class submarines were ordered. Only four had the external tubes, one being HMS Uniqueillustrated here with this painting. The British U class submarines were ordered in 3 batches, the second included “HMSUnique” and was officially a “War Emergency 1940 and 1941 programme, short hull “. The U class submarine was a class of 49 small submarines built just before and during the Second World War. Small submarines, of around 630 tons, the U class were originally intended as unarmed training vessels to replace the H class and to be used as practice targets in anti-submarine training exercises. However the second batch of U class with a displacement of some 730 tons was developed as small and manoeuvrable coastal submarines for use in the waters around the UK and particularly in the Mediterranean. A similar design to the original batch HMS Unique was modified to fire 2 extra torpedoes from a bow “blister”. Records clearly say Unique was one of 4 U class submarines fitted with 2 external tubes in a “blister” at the bow. A further 34 vessels, forming the third group, were ordered in 1940 and 1941. They were similar to the second group, but were lengthened by 5 feet to provide a more streamlined shape. Paxman engines were used in all the boats giving a surface speed of 11.25 knots (21 km/h) and a submerged speed of 10 knots (19 km/h). Paxman was a major British manufacture of diesel engines. All but two of the 49 boats built were constructed by Vickers-Armstrong; the exceptions were HMS Una and HMS Umpire both built at Chatham Dockyard. 19 were lost during the war. As mentioned above, during construction HMS Unique and 3 sister ships were further modified to accommodate four internal and two external bow tubes. The external tubes were dropped from later vessels because they generated a large bow wave and made depth keeping more difficult at periscope depth. Apart from Undine and Unity, all boats were also equipped with a three-inch (76 mm) gun, although they lacked a hatch for the gun crew, who had to use the main conning tower hatch. The U class submarine design was eventually developed into the British welded construction and successful V class submarine. 42 British V class submarines were built for the Royal Navy during World War II. The Royal Navy entered W.W.II with 100 submarines. Many campaigns were fought for our freedom but at tremendous cost and sacrifice. HMS Unique was part of that sacrifice and cost. During 1943/44 your chances of not returning from patrol were 65%. The Victoria Cross as you may be aware is Britain’s highest award for gallantry and bravery. Nine Victoria Cross‘s were won. Many post war admirals emerged from the ranks of the survivors. On the subject of Admirals we are some times asked, why do British submarines fly the notorious pirate flag, the black and white “Jolly Roger”? Although a very innovative officer who had a most distinguished career, much of it working with torpedoes, he is quoted as having said He did not favour the use of submarines as a means of firing torpedoes, calling them “a damned un-English weapon“. Admiral Sir Arthur Wilson caused the Jolly Roger to become the emblem of the Royal Navy Submarine Service when he said “The crews of all submarines captured should be treated as pirates and hanged“. 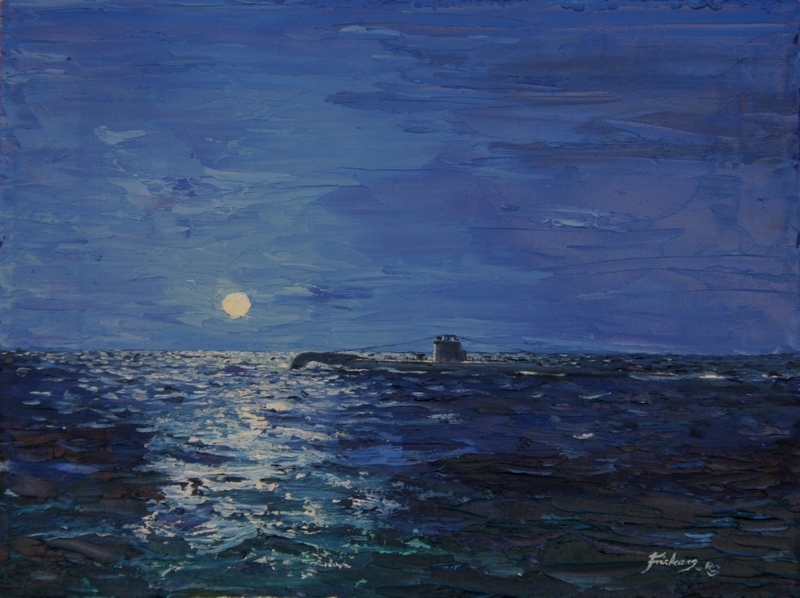 British submariners promptly adopted the Jolly Roger which remains in use today! By the end of World War Two the Submarine Service despite terrible casualties added to its list of battle honours the nine Victoria Cross’s mentioned and numerous other battle honours to numerous to mention here. Another question some times asked is what is the difference between a ship and a boat? The answer is to involved to give in full here partly because over the centuries the definition of a ship has changed. Submarineers remain a breed apart in the Royal Navy, even today in the age of nuclear submaries their vessels are not refered to as ships always as boats. Sir Winston Churchill recognised the courage and sacrifice of the men of the Submarine Service when he said Great deeds are done in the air and on the land, nevertheless there is no part to be compared to your exploits. Water colour made probably by one of the crew, in the private collection of Mr. C Boddington. The Submarine Museum at Gosport failed to reply to emails but did help Mr. Boddington with some research when he visited. The submarine shown as HMS Unique, N19 shown in the picture on Wikipedia, the free encyclopedia is in fact HMS Urge. N 19 was HMS Urge, 4 tubes, no blister.